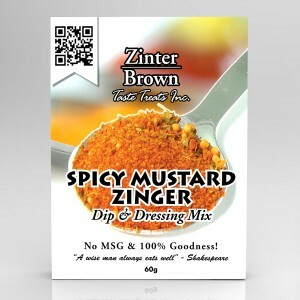 Our Spicy Mustard Zinger is the perfect blend of mustard seeds, brown sugar, garlic, tart lemon juice and a hint of salt; but it's the addition of Hungarian paprika that really sets this gourmet mustard spice apart. Our Spicy Mustard Zinger will help create new taste dimensions! Use Gourmet Mustard Zinger as chili mustard seasoning for crockpot chili, or hamburger seasoning for your backyard barbeque. Create magic in goulash, stews and gravies. 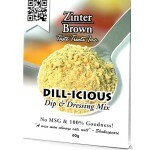 Rub this gourmet mustard seasoning on steak, chicken or a roast before roasting. Make a fabulous cheese ball: Mix 2 tbsp gourmet mustard spice into 1 cup cream cheese. In fact, if your gourmet senses uncover a particularly delicious application for this caviar of spices, share it with us. 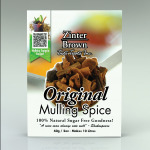 Stock your kitchen with all our delicious spices, dip and dressing mixes, pepper pots andcondiments. 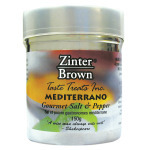 Buy Zinter Brown gourmet mustard spice online. Local and international shipping available.